Grab a blanket and see some classic films under the stars. That's the idea behind the Academy's latest summer series, revolving around its new open-air theater. The series lineup, titled "Oscars Outdoors," was revealed by Academy President Tom Sherak on Monday. It runs Friday, June 15, through Saturday, Aug. 18. Grab a blanket and see some classic films under the stars. That's the idea behind the Academy's latest summer series, revolving around its new open-air theater. The site is part of the organization’s nearly 7.5-acre Academy Hollywood campus and includes the Pickford Center for Motion Picture Study, home to the Academy Film Archive, the Science and Technology Council and the Linwood Dunn Theater. 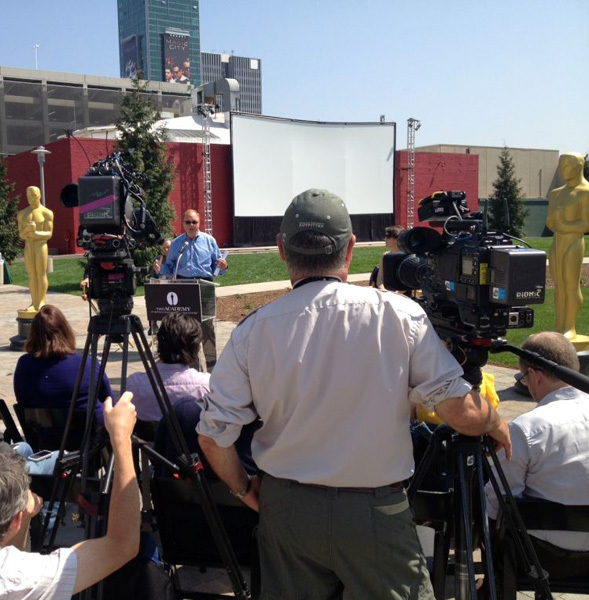 The series lineup, titled "Oscars Outdoors," was revealed by Academy President Tom Sherak on Monday. It runs Friday, June 15, through Saturday, Aug. 18.
at the new open-air theater. Photo: Academy. The series devotes every Friday night to classics and contemporary favorites aimed at adult audiences, and every Saturday night to family-friendly fare. The final Friday night presentation, on Aug. 17, will be an "Audience Choice" selection, determined by fans who cast votes here. Most features will be preceded by surprise animated or live-action short subjects. "We are very excited to expand on our innovative programming and provide the community with a new venue that will deepen our ties to Hollywood," said Sherak, in the press release. "The events we are planning for the rest of the year are an ideal way to share our love of movies with a wider audience." On Saturday, May 19, the Academy will inaugurate its new open-air venue with an invitation-only screening of 1989 Best Picture nominee "Field of Dreams." Demolition at the site began in July of 2011. The renovated space now features an expansive lawn and an adjacent 10,000-square foot plaza, and will include a permanent 40x20 foot screen. In addition to hosting the "Oscars Outdoors" screening series, the venue is expected to serve the Academy and the community as an event space for special screenings, educational programs and other functions. Saturday, Aug. 4: STEAMBOAT BILL, JR.
Tickets to each "Oscars Outdoors" screening are $5 for the public; free for children 10 years and younger; and $3 for Academy members and students with ID. Seating is unreserved. Tickets are available at www.oscars.org/outdoors. Gates will open at 6:30 p.m. Screenings begin at sunset. Attendees are encouraged to bring low lawn chairs, blankets, warm clothing. Popular food trucks will be on site during each screening. The Academy Hollywood campus is located 1341 Vine Street in Hollywood (between De Longpre Avenue and Fountain Avenue, and between Vine Street and Ivar Avenue). The campus is accessible via the Metro Red Line train and the 210 Metro Local bus. Free parking will be available. 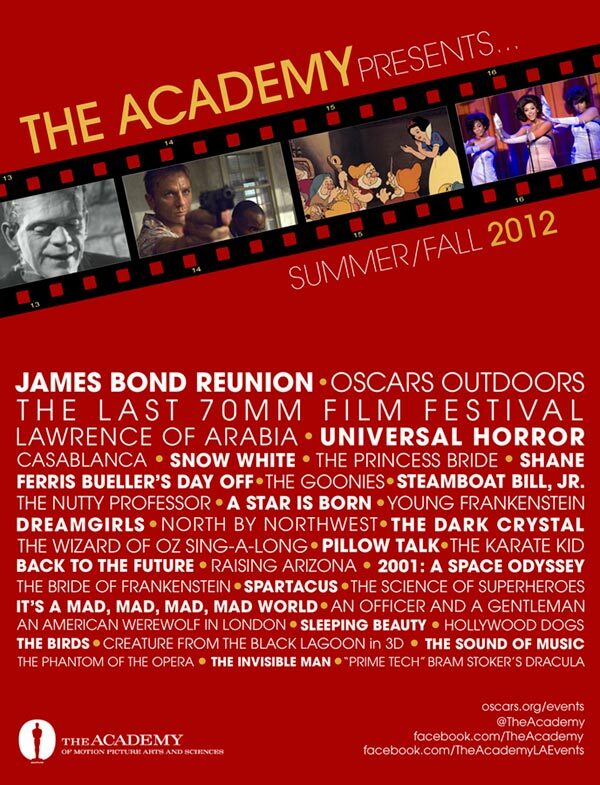 The Academy also has a full slate of other events throughout the organization, including 50th anniversary celebrations of the James Bond franchise and the Oscar-winning epic "Lawrence of Arabia." 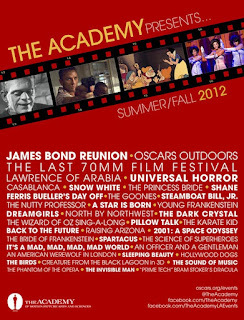 The Academy will also host a busy schedule of events at its theaters in Los Angeles and New York as well as programs at venues in London, the San Francisco Bay area and Washington D.C. Summer-fall highlights include a centennial celebration of Universal Pictures, featuring a slate of the studio’s landmark horror films; "The Science of Superheroes;" and "The Last 70mm Film Festival," which will span six genres over six weeks. An expanded summer and fall programming calendar is available here. "These are not just screenings, but events," said Randy Haberkamp, Managing Director, Programming, Education, and Preservation, in a statement. "We’re bringing a diverse range of programs and experiences to audiences as only the Academy can."